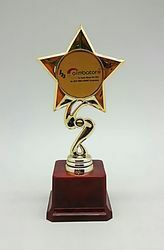 Leading Manufacturer of star trophy, 3d crystal trophies, cricket trophy, golden trophy, silver star trophy and wooden gold trophies from Coimbatore. 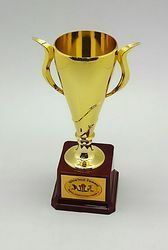 Gold coated Fiber trophy. 8.5"inches height. It has 35*55mm of printing dimensions. Contains hard fiber base. 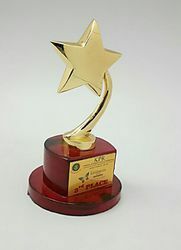 Comes with 11"inches of height.Combination of gold and silver coated fiber material. It has 25*45mm of printing dimensions. 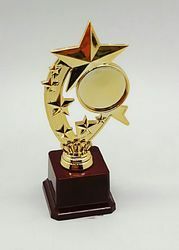 Gold coated fiber trophy height 7.7" inches and comes with 50*36mm Printing dimensions. 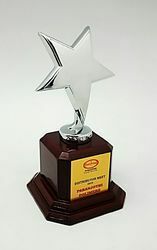 This Trophy has 8.7"Inch height. 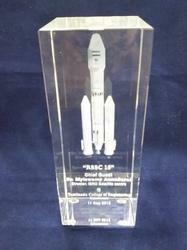 And comes with 35*55mm of printing dimensions.